This Government appreciates the potential benefits of wild camping in England and its attractiveness to campers who already have the opportunity to camp in the wild in Scotland. The Land Reform Act in Scotland allows for wild camping, but the land issues and the legislation in England are somewhat different. The introduction of wild camping in England would be a controversial issue, which would require both significant consultation and legislative change. 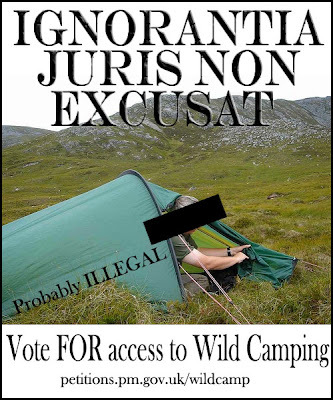 On open access land wild camping is prohibited under Schedule 2 of the Countryside and Rights of Way Act 2000, which lists all restricted activities. Therefore, new Regulations would be required to exclude wild camping as a restricted activity. Any change to the current rules on wild camping in National Parks and Ministry of Defence land would require new primary legislation. The Government has no plans to allocate the necessary resources to consider proposals for such legislation at present, and is concentrating on following up the successful introduction of 750,000 hectares of open access land with new legislation on access to the coast in the Marine Bill, which is currently going through Parliament. So that's two petitions and twice the government has decided to do nothing! I was going to write you a long post moaning about the state of the nation and the lackwits who are governing us, but to be fair Aktoman has raised all the necessary points without sounding like an old fart so I'll just point you in his direction. And for those of you resident in the UK, or carrying a UK passport, urge you to get involved in stage two of the campaign for us to be able to take a nap in the big out doors that our forefathers made such sacrifice for, before some bright spark in the cabinet office invents a way to put a meter between us and the fresh air.